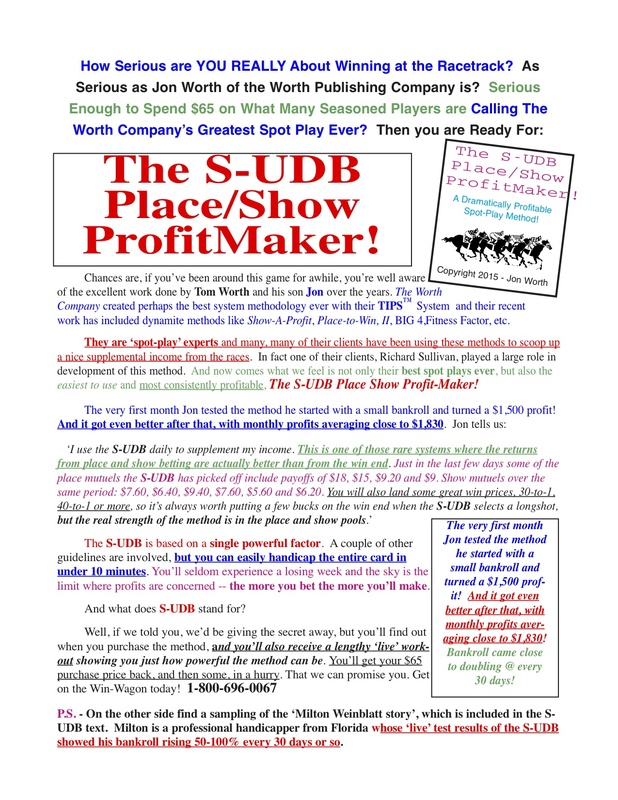 The S-UDB PLACE SHOW PROFIT-MAKER! Great Bankroll Builder! +++ Jon’s TRIPLE THREAT CONTENDER SYSTEM & Owen’s JB Special FREE!! No long runouts on the place and show end — fascinating STUFF! Conservative Players – Rejoice! Sit Back, Relax, Don’t Worry — S-UDB will do the job for you! one of his most popular ever, and also a copy of Walt Owen’s new J-B Special at absolutely no additional charge! The J-B Special will retail at $48 when offered to the general public. It is designed specifically to take advantage of the expertise of the jockey, which when combined with just two other factors, works like a charm. Not only is it easy to use, but it is also extraordinarily accurate. In our tests, the selection finished 1st or 2nd 53% of the time! 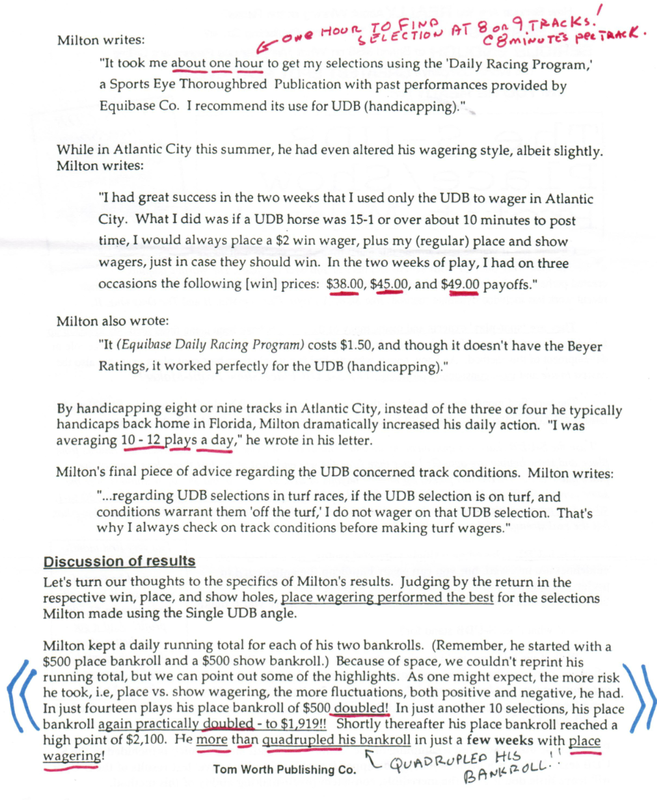 So it’s great for win betting, and it’s great for Exacta and Quinella play as well. 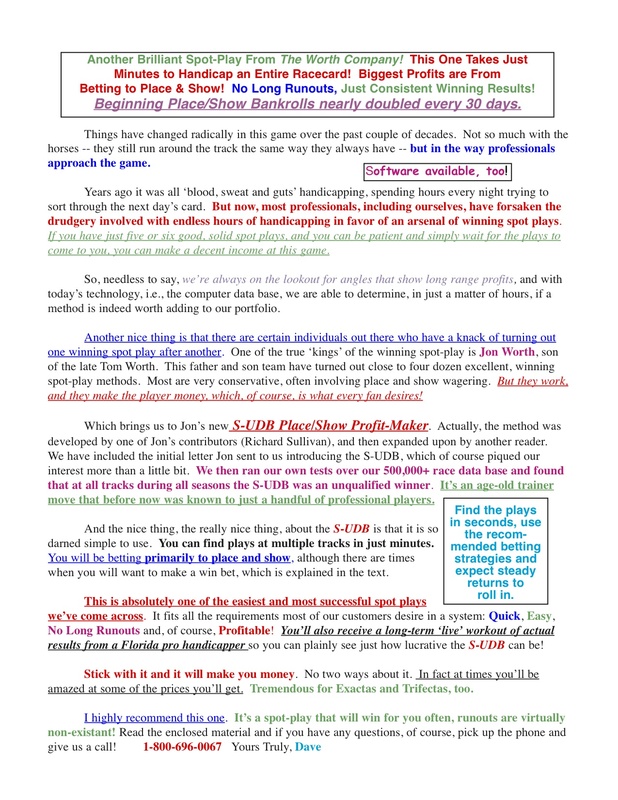 The J-B Special is a super value at $48, but even better (obviously) when it’s FREE with your purchase of the S-UDB Place/Show Profit-Maker! Ditto with the Triple Threat! Follow the very simple rules and examples and you will be visiting the Cashiers Window on a much more regular basis.